Britney Spears will launch Island Fantasy in April. The new perfume for women is a flanker to 2005's Britney Spears Fantasy, and follows Midnight Fantasy (2007), Hidden Fantasy and Circus Fantasy (both 2009). Embodying sun-kissed petals carried by an ocean breeze, island fantasy BRITNEY SPEARS™ is inspired by Britney’s ideal paradise – a remote island where she can relax and rejuvenate with her loved ones. The scent channels the warmth and playful spirit of the tropics, and brings an island escape to everyday life. Notes for the fruity floral include citrus cocktail, mandarin, clementine, watery melon, red fruits, jasmine, freesia, violet, musk and sugar cane. 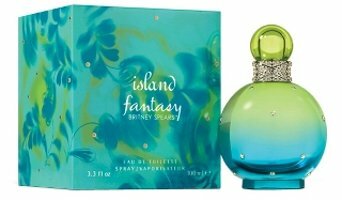 Britney Spears Island Fantasy is available in 50 and 100 ml Eau de Toilette. I liked Fantasy for a while…now I can’t stand the smell of any of the B.S. line. Fantasy was the best of them, probably. i like vague copy writing. ‘citrus cocktail’. followed by two citrus fruits? should have gone for white flowers too. I like the scents of freesia and violet but not in perfume for me (maybe in bathroom candles) and definitely not together in a perfume for me. They both make me nauseous. I can only imagine if that was mixed with over sweetened Kool-aid….ug making me queasy now! Ditto for me…freesia rarely works for me in fragrance. I’ll give it a sniff when I see it . I like her other Fantasy line .I have at least a mini of each except for Circus .Haven’t got around to getting that one (ok berry-lemonade scent in my opinion). I hope the melon isn’t prominent/smellable. From the notes it sounds mostly citrus. “Watery melon”? Aren’t all melons watery? I don’t like most melons, so maybe I’m wrong. At least they admitted watery melon was a note. Thanks so much for the report! I wonder if it is going to be exclusive to Kohls. There is a Kohls, but it has a really crappy fragrance department, and frequently when I’ve gone there particularly to check something out, there is no tester. So it’s pretty rare that I’m willing to make a special trip. Sounds like this one would not be worth it! Yeah, it’s definitely a been there, smelled that before fragrance. Haha!